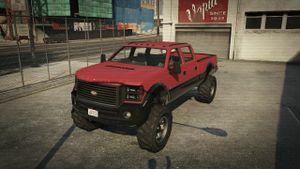 A Sandking XL in Grand Theft Auto V.
The Vapid Sandking XL is an off-road oriented pickup truck in Grand Theft Auto V. It is based on the 2008-2010 Ford F-250 with influences from the 2010-2014 Ford F-150 SVT Raptor. A Sandking XL in the GTA Online trailer. A Sandking XL frequently spawns on the beach on the south side of Pleasure Pier. Sandking SWB: extended cab variant. This page was last modified on 26 December 2013, at 04:59.